Build a landscape right the first time. And that can only be done with a plan—a new landscape design plan, that is. 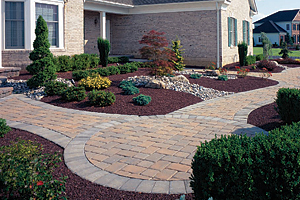 It will be costly to redesign or repair a poorly designed and installed landscape. This is obviously an important job better handed over to experts like Landscape Magic. Our men have lived most of their lives in Sedona, Village of Oak Creek, Clarkdale, Cornville, and other major cities in Arizona. We are not limited to the theoretical rules on how to create new landscape designs; we will work with your ideas and visions. To prove our expertise are the various licenses and certifications from different reputable bodies. Of course, there is the license to construct landscapes from the Arizona Office of the Registrar of Contractors. We are also a certified concrete paver installer by the Interlocking Concrete Paver Institute (ICPI). Not to mention that our company is the only certified installer of Belgard products in Sedona and one among the very, very few in Arizona. It is never easy to get these certifications and licenses. But we did. 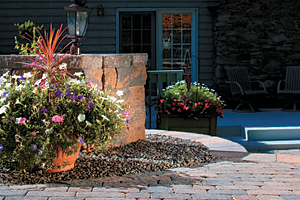 Every new landscape design we create is a product of our years of education, training and experience. Green landscaping is dramatically becoming in-demand in the landscape business. That is a good thing because besides being earth-friendly, green choices are also cheaper and easy to maintain. That's why we ensure that sustainability and ease of maintenance are always considered in every new landscape design we create. No need to worry about a water-hungry lawn because we can include a rainwater harvesting system in the landscape design. What's the use of our accreditation from American Rainwater Catchment Systems Association if we can't build that for you? Aside from that is our continued preference for low voltage lighting systems. Other systems can be added for better convenience. Less maintenance work will mean more outdoor fun for you. Scale, functionality and unity are the measurements of modern landscape. But we ensure that safety comes first, even on top of the aesthetic appeal. We will never compromise your safety for the sake of a beautiful landscape. After all, we can always create a new landscape design that is still as beautiful as your dreams yet not as hazardous. Our design team can do that because we have completed the training for a wildfire defensible landscape in the University of Arizona. We also learned our firefighting and wild land fire skills from Arizona Wildfire Academy. With us, there is no need to ask if something is safe because everything in the new landscape design is guaranteed safe. There are other factors to consider when creating a design for a landscape. We want to listen to your thoughts because your design taste is also a vital element in a beautiful new landscape design. Please feel free to call us for a free estimate and consultation. Our goal is to create an enjoyable and beautiful landscape scene for every Arizona client that we serve.